Yes, the rumors are true. Another miracle has occurred. As we imagined for the past year, but never quite believed possible, the MGB engine and transmission are mounted in our steel Locost space frame chassis. The part we never really believed possible is that you could somehow slip the frame over the engine and transmission, and thereby eliminate the whole cherry-picker engine installation process. But it actually worked. It almost didn't. The engine/transmission combination was a couple of inches longer than the distance between the E tube up front and the A2 tube in back. The frame just wasn't going to fit like that. We stood back and contemplated separating the two big drive train components, which we'd really hoped to avoid, when it occurred to us that all we needed was a steeper frame angle. 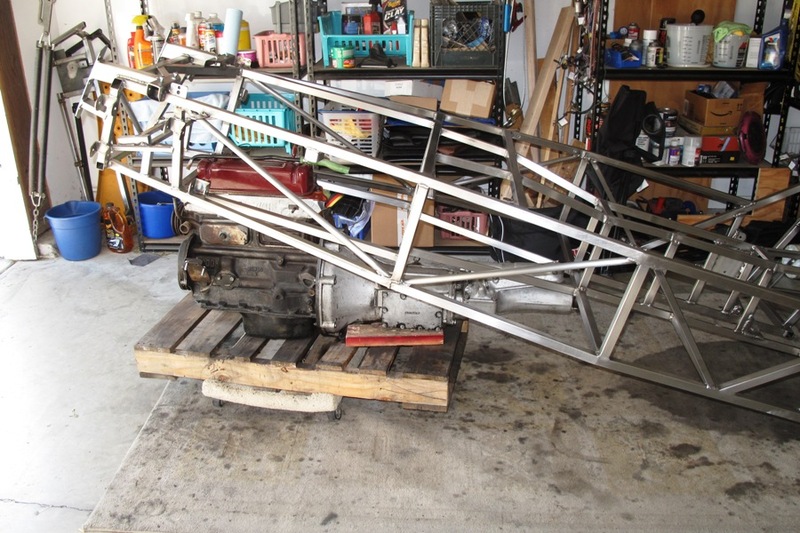 If we could slip the tail of the transmission over the A2 tube and into the tunnel, we should then be able to drop the front of the frame over the engine. 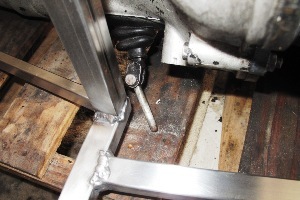 But to do that, we needed to lower the back end of the frame about three feet. Unfortunately, the garage floor was in the way. 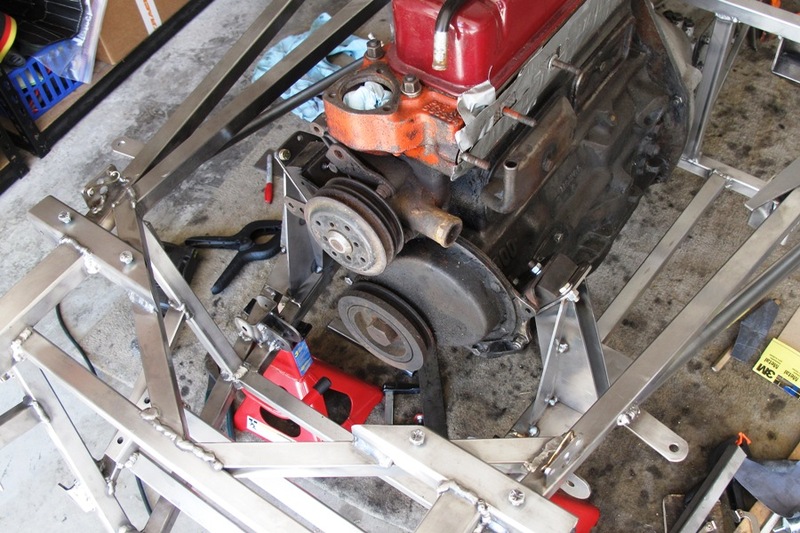 We thought we might accomplish the same thing by raising the back of the transmission three feet, but that seemed quite dangerous because the engine wasn't actually attached to anything, and could easily fall over with the slightest provocation. So we first made sure no one was looking, then quickly jacked up the back of the transmission until it cleared the A2 tube. Mission accomplished, and no serious injuries. 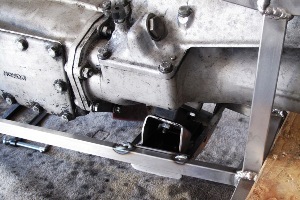 We lowered the transmission back to the ground, and the front of the frame slipped easily over the motor. As you might imagine, we were stoked, but the most exciting part was that the entire thing fit exactly like we drew it up, or would have if we actually had drawn it up. Instead, what we did was trial fit everything in the mock-up frame, and as I seem to recall now we had the same issue with the E and A2 tubes back then, but I guess it wasn't a major problem in a frame that you could rip tubes out of with your bare hands. So the engine and transmission are installed in the frame, and clearances are definitely tight all around, but certainly adequate. No less than half an inch anywhere, but not much more than an inch anywhere, either. 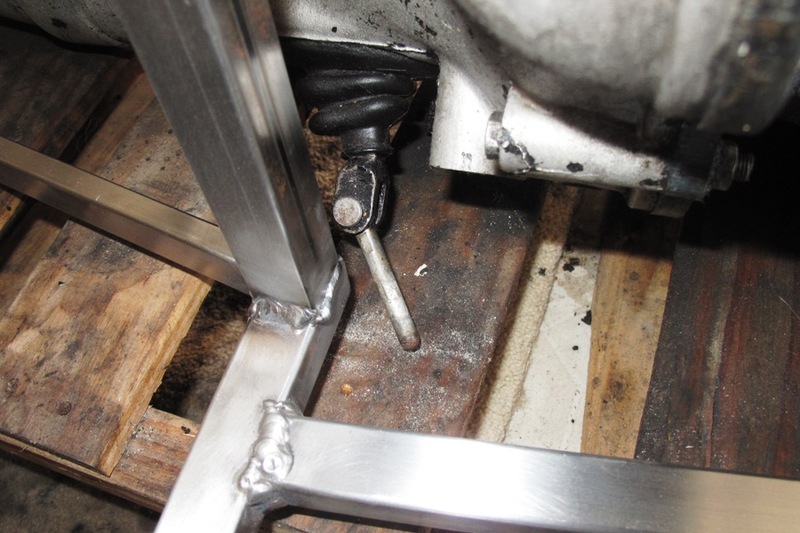 Our only real doubts were in the area of the clutch slave cylinder, which we never actually installed in the mock-up frame, but we did estimate the clearance as best we could, and then added an inch to our estimate just for luck. It turns out that our actual clearance now is three-quarters of an inch, which is why we added the inch, luck not being our strong suit. In the less encouraging department, we spent an entire day doing nothing more than positioning the engine and transmission in the frame. 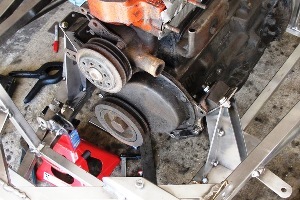 The transmission mount had to be chopped down from the stock unit in several stages, using an iterative process that would be ultimately hard to describe and therefore impossible to understand, but boils down to meeting the basic requirements that the drivetrain sits totally vertical in a perfectly longitudinal configuration in the exact center of the car at a precise distance from the firewall. Compound this by the difficulty in moving a hundred-pound frame in very small increments, and the fact that any correction you make to any of these measurements affects all the others, and you end up chasing your tail for the better part of the aforementioned day. 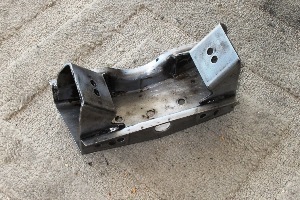 It did not help that the transmission tunnel in our particular Locost is not in the exact center of the car, but is off to the driver's side by 1/16". We didn't plan it that way, but stuff happens. After several hours of using the transmission tunnel as a reference, a double-check against the outer frame rails revealed the discrepancy. Even so, it shouldn't have been that hard. You'd think that you could just jiggle things around a bit, and have everything lined up within an hour or two, tops. And you probably could, if all you had to do was jiggle. If you also had to trim down a transmission mount to exactly the right width, and have it perfectly centered, and you had to bolt it in each time you trimmed a little off to check all the measurements, and remove it each time you had to shave off another 1/16", the process might take a little longer. Motor mounts actually supporting 400 lbs. But we kept at it, and by the middle of the second day the transmission mount received its final shaving, centering the driveline in the chassis with the distance between the motor mounts and outer frame rails up front exactly 7-7/32" on either side. And at this point the engine backplate measured 3-1/4" from the firewall, slightly better than our planned 3-1/2", so we shimmed the chassis slightly on the jack stands until it sat at the exact same angle as the engine. And the motor mounts, which had been bolted to the engine the day before, were carefully tacked in place. And the engine was in. 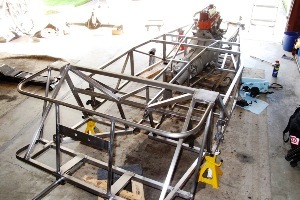 If that wasn't enough excitement already, the big moment came when we jacked up the chassis another few inches, until the entire weight of the drivetrain was no longer resting on the floor, but on the tack-welded engine and transmission mounts. That was huge. We looked out in the garage this morning and the mounts are still holding, so it's all very promising. And with that little bit of effort, we moved three steps closer toward our short-term goal of having something that looks like a car that we can actually roll in and out of the garage. We confirmed the list of remaining tasks in this phase of the operation at 14. Several of these tasks involve rebuilding the front wheel hubs and reassembling the rear axle, which includes a lot of cleaning and painting, which we've been stalling around on for a long time. Cleaning isn't so bad, and neither is painting, but waiting for paint to dry is hard. In the meantime maybe we can start working on more fun stuff like the dashboard. A few months ago, when the Locost was just a few frame tubes tacked together on the build table, I can remember staring at the simple steel structure late at night and thinking, there's no way. There was just too much to do. All those components and plumbing and electrical work. All those brackets and not sure how to make everything, and not even sure everything would fit. Overwhelming. So I had to stop thinking about it, which I did, and just plugged along, and now here we are. Not close to done, not by half, but there's a way. I can think about everything that's left to do, and not get overwhelmed. That's progress. 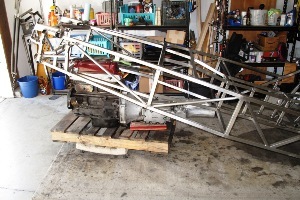 HI, I'm fascinated by your build, mostly because I've used MGB fron end parts (swivel assemblies, brakes and wire wheels) for my own scratch build - a Morgan 3-wheeler-inspired reverse trike. (I've got a build log on locostusa.com in the non-traditional builds forum.) I absolutely identify with your commentary about feeling overwhelmed by the amount of work that needs to be done. I had several moments like that myself back when I started cutting metal (aug of 2010, I"m a bit more than 2 years in now). the only thing you can do is compartmentalize, and take it one task at a time. good luck! And, have fun! Never would have thunk I would find this so inidepensabls.